Chelum linked traffic plan for M.A.Jinnah is expected to be effective midnight Wednesday/Thursday and last until the end of the processions late evening Thursday 3rd Jan 2013. 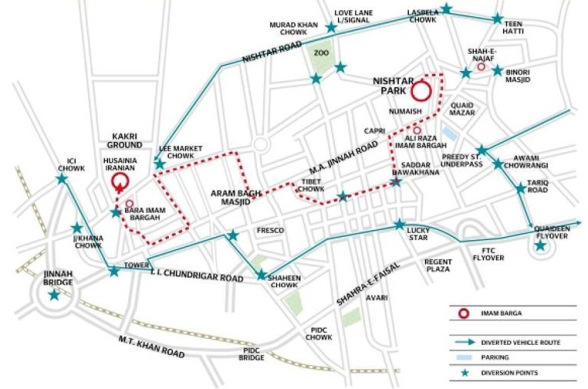 On 3rd Jan feeder processions from other parts of the city are expected to commence early in the day. Prepare for unannounced temporary closure while the feeder processions pass through the various areas. – Road Blocks/Diversions as per map. – Pillion Ridding Ban from late night Wednesday 2nd Jan until late night Thursday 3rd Jan.
– Closure of shops, restaurants, businesses, petrol pumps & public places on M.A.Jinnah Road from Tuesday evening.